Sidewalls - MGT Insulation, Inc.
At MGT Insulation, our objective is to leave your home or business looking as good as it did before we came. That’s why sidewall insulation is done from outside whenever possible and never drill through your siding. Our technicians expertly remove siding before blowing cellulose or fiberglass insulation into sidewalls, and when they’re done, your home or business will not only look great, it will function properly! Before 1979, there was no standardized energy code and no nation-wide requirements for energy efficiency in buildings or building materials. Now, the Minnesota building code requires new wall construction to have an insulation value of R-21. At MGT Insulation, our comprehensive sidewall insulation process not only ensures that your walls are properly insulated, but that they look great too. Here’s how we approach sidewall insulation projects. Our highly trained technicians use state-of-the-art equipment to identify areas of energy savings for you. An infrared camera, especially done in conjunction with a blower door test, can identify uninsulated and poorly insulated wall cavities. Our crews perform an initial walkthrough with you to determine the most effective strategy to complete your insulation project. If necessary, we’ll drill a small hole in an outside wall in an inconspicuous place to look at your current insulation, and then plug the hole with a tight-fitting plastic plug. This determines existing insulation type and amounts. We carefully protect your home, business, and belongings with thorough worksite preparation, including clean drop cloths, plastic, and our state-of-the-art Air Scrubber filtration system. If your home or business was built in 1978 or earlier, it might be necessary to use lead-safe practices when insulation your structure. When necessary, we test for lead based painted surfaces before proceeding. At MGT Insulation, our goal is to leave your home or business looking as good as we found it. That’s why we never drill holes in siding. Our technicians have the training and careful technique — gleaned from years of experience — to successfully remove and re-install siding. The only exceptions to this are stucco or brick siding, which requires a different strategy. Insulating with stucco siding: Stucco walls can be successfully patched by a trained stucco contractor. The skill is to replicate the texture and color of the surrounding wall area within a series of 2 1/2″ holes — and done in such a manner that the holes blend with the existing stucco. Insulating with brick siding: Brick walls must be insulated from the interior. This requires good preparation of the site before starting. Luckily, our technicians have the skill to prepare and insulate your walls from the inside by removing wall hangings, moving furniture away from the outside walls, covering floors, and covering furniture. 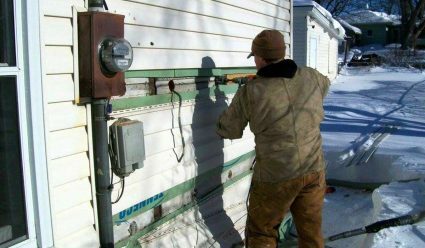 A row of small holes are drilled, at least one per cavity per floor, through the sheathing that lies beneath the house siding, after the siding has been properly removed and retained for re-installation. At MGT Insulation, we use the one-hole-method for drilling holes to open wall cavities alongside a specialized drill bit. This allows us to minimized wood shavings and debris. We insulate sidewalls with dense-packed insulation – cellulose or fiberglass. Our equipment has the blowing capacity to create densely packed insulation and our installers are well-trained to do so. This is important because less air space between fibers means that your insulation will be less prone to settling. It also creates a tighter barrier against air infiltration from the outside. Insulation is blown into the sidewall cavities with a small diameter wall tube using a high pressure, high capacity insulation blowing machine, installed in the MGT Insulation work truck. Our crew uses its own power for the machine with a gas-fired generator. Wood or Styrofoam plugs are friction-fit into drilled out wall cavity holes. Our technicians carefully reinstall your siding so that it looks as good as it did before. We perform another blower door test to determine your home or business’s increase in comfort due to reduced air leakage through your walls.